Humza Yousaf MSP (SNP, Glasgow), Parliamentary Liaison Officer to the First Minister of Scotland, Alex Salmond, makes the case for Scottish independence. No one cares more about Scotland’s success than the people who live here and that, ultimately, is why independence is the best choice for our future. Independence is about making Scotland more successful. At its most basic it is about the ability to take our own decisions on the issues that affect life in Scotland, Scotland’s economic prospects and our position in the world. And that is something the people of Scotland understand. Being able to take those decisions in Scotland would see a Scottish Parliament able to bring an end to nuclear weapons off Scotland’s shores and the billions of pounds spent to maintain them. Independence would enable a Scottish Parliament for example to develop a pensions system that supported our elderly properly. It would mean that when the people of Scotland oppose illegal wars we cannot be forced into them and it would see a Scottish Parliament able to make the economic decisions on taxation and investment that would grow our industries and take full advantage of our second energy windfall. In the most recent survey of social attitudes in Scotland 43 per cent of people in Scotland wanted the Scottish Parliament to make all decisions for Scotland. That is independence and support for making all decisions in Scotland is on the increase. The fact that only 21% wanted to keep things the way they are may hold the key to David Cameron’s panicked intervention. People in Scotland also understand clearly how independence will be achieved. In May’s elections the SNP said we would hold a referendum on independence in the second half of this parliamentary term and that is exactly what we will do. If others who favour more powers – the devo max option – want to ask a question on that we are open to their ideas, but for us and for me it is independence that presents the best opportunity for Scotland. What David Cameron and his colleagues do not understand is that a referendum on independence is an exciting opportunity for the people of Scotland, not a party political game, and we owe it to the people who voted in May to stick to our word. The unwise intervention of Westminster politicians seeking to dictate the timing and questions of a referendum for which they have no mandate demonstrates that the only confusion on the issue is amongst the anti-independence parties who don’t seem able to accept that as a government we will stick to the promise we made to the electorate. Instead of putting themselves into a state of disarray the anti-independence voices at Westminster and the prime minister would be wise to hold to the position that they have all previously acknowledged, that the Scottish Parliament has the right to hold the referendum and that all these matters will be determined by the people and parliament of Scotland. And the PM’s argument that this is all about economic uncertainty does not hold up to scrutiny. When the same claim was made by George Osborne and Danny Alexander neither could produce any evidence to back it up. The prime minister himself unveiled record new investment in the North Sea by BP and the Scottish government has worked hard to attract new investment into Scotland from global companies such as Avaloq, Dell, Gamesa, Amazon, Doosan Power Systems and Michelin, to name just a few. So what should the UK government be doing? In May the SNP said one of our priorities would be improving the economic powers of the Scotland Bill – a piece of Westminster legislation that currently does little to transfer the levers of economic growth. Last month a Scottish parliamentary committee sent the UK government our recommendations for enhancing that legislation and for limiting the damage it will do. Next week the House of Lords will begin to discuss the bill.While David Cameron interferes with Scotland’s referendum he has yet to confirm if he will make the changes Scotland is asking for to his own legislation. Instead of sabre-rattling on the referendum, the UK government should be amending and improving the Scotland Bill to give the Scottish Parliament the economic and financial powers so we can do something about the disastrous impact of Tory/Lib Dem policies in Scotland. Whatever the prime minister and his colleagues do, independence will be decided by the people of Scotland in a referendum taking place in the second half of this parliamentary term. The anti-independence parties will have their case to make – once they’ve worked it out – but that case is increasingly damaged by blundering interventions seeking to dictate terms to the Scottish people and their democratically elected Scottish Parliament as voters contrast the behaviour of the Tories and their allies with the Scottish government’s commitment to the people of Scotland. As an English born man with Scottish ancestry who considers himself a “Londoner” it saddens me that the world seems to want to break up into ever smaller states. The borders between England Scotland and Wales are completely artificial having moved hundreds of miles either way over the years so where do we decide where nations begin. As a kid in the 70’s and 80’s I was brought up a socialist who would watch Star Trek every week thinking the future was a world without nation states and one people united together! But good luck anyway to my Scottish brothers and sisters in what they decide their future to be. Thanks for the detailed and informative post. I’d be interested to know if you think an independent Scotland would look at reversing the regressive immigration policies of the Coalition and consider re-instituting something like the Fresh Talent For Scotland scheme that Westminster forced to be scrapped. For all their fluffy talk the SNP are still grim-minded nationalists, with an ideology built on xenophobia and the politics of division, resentment and envy. The people of England, Northern Ireland, Wales and Scotland are all countrymen who have lived and worked together for 300 years, forging one of the greatest most cosmopolitan nations on earth. The SNP want to tear that great achievement apart. They are a party devoted to balkanisation, building barriers and promoting prejudice at precisely the time we should be coming together to work together to face the challenges before us. 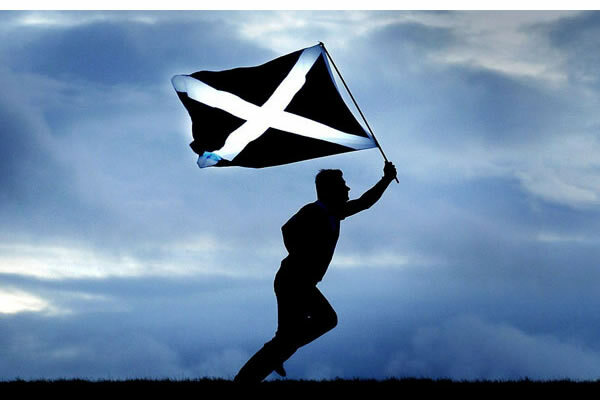 I remain sure that despite their small-minded politicial machinations that I will be able to remain for the rest of my life proud to be able to call my Scottish brothers and sisters fellow countrymen, and to know Scotland is as much my own country as Somerset or Yorkshire, and know that my Scottish countrymen are able to say and feel the same. Despite the SNP’s best attempts to divide us from each other and turn us against one another and turn family into strangers. Anyone who considers themselves progressives should shun these divisive, archaic nationalists. There are only two parties in the UK who are dedicated to dividing one type of briton from another on the basis of ethnicity or nationalist: The BNP and the SNP. There’s little wonder there’s only one letter between them. Wait until you have to pay your own way by taxes from the Scots only! Will you take a Barnett formula share of the UK debt with you? This comment is an utter disgrace and leaves a really bad taste in the mouth. The suggestion that the SNP are similiar to the BNP is particularly disgusting. Your ramblings show that you have absolutely no understanding of the political situation in Scotland and you come across as a bitter and twisted Unionist. It is interesting that so many British socialists feel the need to deny ‘Scottish’ people their place in the world, while at the same time supporting the rights of others around the world to do so. It would seem that we are not entitled to the right of self determination as we don’t exists we are just a ‘region’ (North Britain?) of Greater England, oops UK. I suggest you consult the Act of Union 1707. What the independence debate is about is building a positive future for ‘our’ country i.e. Scotland. What the SNP are offering are constructive ways and ideas for the country to reach its potential. I and many others in Scotland hear plenty of carping from Unionsits about dividends and benefits but what exactly are they? As far as I am concerned we can build a better country on our own and this includes relationships with out partners. Shame on you for suggesting that self determination equals xenophobia. I thought this was a blog for progressives, not nationalists? Shame. The comments on here show how little insight there is by many on the left into their own latent nationalism and Xenophobia. To parade anti Scottish sentiments as internationalist shows that the crisis of the British State is also producing a crisis in the English left as their instinctive superiority complex cancels out whatever radical credentials they claimed to have. Paid attention to cheating before, during and after the referendum. It happenned before in another ”country” when there was a referendum. Vive l’Écosse! Vive Scotland!